262 pages | 5 B/W Illus. This is a book by educators, for educators. It grapples with the complexities, the humanity and the possibilities in education. In a climate of competing accountabilities and measurement mechanisms; corporate solutions to education ‘problems’; and narratives of ‘failing’ schools, ‘underperforming’ teachers and ‘disengaged’ students; this book asks ‘What matters?’ or ‘What should matter?’ in education. Based in the unique Australian context, this book situates Australian education policy, research and practice within the international education narrative. It argues that professionals within schools should be supported, empowered and welcomed into policy discourse, not dictated to by top-down bureaucracy. It advocates for a flipping, flattening and democratising of the education system, in Australia and around the world. 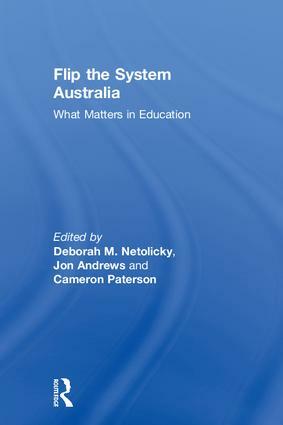 Flip the System Australia: What matters in education brings together the voices of teachers, school leaders and scholars in order to offer diverse perspectives, important challenges and hopeful alternatives to the current education system. This excellent book is an exemplary collaboration between teachers, school leaders, and educational researchers. By pointing to a vast range of challenges, tensions, and spaces for hope and possibility, it gets to the heart of what’s important in contemporary Australian education. The book is an urgent call to ‘flip the system’ for the creation of more equitable and generative schooling for all Australian children and young people. It is an important and timely reminder of the power we have as educators, both collectively and individually, to engage in this crucial work. This book will be a very welcome addition to the professional libraries of Australian educators and schools. It has a combination of new voices and new thinking from experienced academics that can be read sequentially or can be read by dropping into particular issues and themes. Its commitment to providing a forum for these voices as they contest some of the big ideas, trends, myths and confusions of education will add depth to the broader educational debate and professional thinking in the next decade. In far too many countries around the world, education as the practice of freedom has become degraded into an alienating experience for teachers and students alike. Australia has not been immune to these pressures, but its educators are rallying and providing a powerful set of new narratives and agendas for the future of our young people and our endangered planet. For all of those intrigued by the prospect of uplifting the human condition through education for a rising generation, 'Flip the System Australia' is an indispensable guide and a clarion call to action. By giving voice to the real work of teachers while recognizing students as individuals, Flip the System Australia invites us to embrace the rich, nuanced, complexity of teaching and learning. By treating the reader as a trusted and engaged colleague, this book elevates the conversation beyond "what works" to begin to explore new possibilities of what education might be. As with the other volumes of Flip the System, one will not find a simple compendium of platitudes, prescriptions, or advice; but rather a surfacing of important questions and issues. In doing so, this book reminds us that education is fundamentally about people, potential, and possibilities. Deborah M. Netolicky has almost 20 years’ experience as a teacher, school leader, and researcher in Australia and the UK. She is Honorary Research Associate at Murdoch University and Dean of Research and Pedagogy at Wesley College, Perth. Deborah blogs at theeduflaneuse.com and tweets as @debsnet. Jon Andrews leads his school’s staff professional development program, system of teacher coaching and feedback, beginning teacher mentoring and staff engagement with professional learning. Cameron Paterson is responsible for the strategic leadership of learning and teaching, innovation, and promoting excellence in teaching practice at SHORE School in Sydney. He is closely connected to Harvard’s Project Zero. In 2016, he received the 21st Century International Global Innovation Award for Teaching.